New Haven: Yale University Press, 1998. cloth, hard cover in dust jacket in cardstock slipcase, as issued., slipcase has some creasing, but is intact, no other flaws or wear. clean, no markings, sturdy, sound binding . ; large, heavy book. ; english text., xviii-506pp., 544 illustrations, including many color plates. 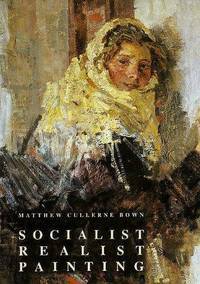 detailed, comprehensive history of soviet socialist realist painting.. First Edition. Hard Cover. Near Fine/Near Fine. 4to - over 9¾" - 12" tall. Keywords: Russian Art. ; Soviet Art. ; Twentieth Century Soviet Art. ; Social Realist Painting.